Three community leaders in Pequannock Township, N.J., were among the first to heed a societal shift in the early1960s of a growing population struggling to cope with the demands of life. The Rev. Donner A. Atwood of The First Reformed Church of Pompton Plains, Dr. Kurt Manrodt and municipal judge Herbert Irwin each realized he alone could not fix the problem, so they, along with concerned residents Mary Jane Kelly and James Ryan, joined forces to find a solution. What the community desperately needed, they realized, was an organization that could provide professional treatment close to home. They understood that helping people bring balance to their lives would in turn strengthen the community. On December 23, 1963, NewBridge Services, Inc. was founded as the Pequannock Valley Mental Health Center and opened its doors in the former Pompton Plains library, next to town hall. Its mission: to provide mental health services to adults and children in Pequannock and five neighboring towns in eastern Morris County. The agency continually expanded its scope of services and the towns it covered. It wasn’t until 1998 – the year it earned national accreditation and began serving Passaic County – that it became NewBridge Services. The new name helped the organization build its identity as a premier service provider in northern New Jersey. Back in 1977, NewBridge tripled in size. Its part-time Day Treatment Center went full time, emergency psychiatric services were added and counseling for at-risk clients increased. That same year, NewBridge became one of the first mental health agencies in New Jersey to create a Youth Services Bureau to focus on the needs of children and adolescents with mental illness. 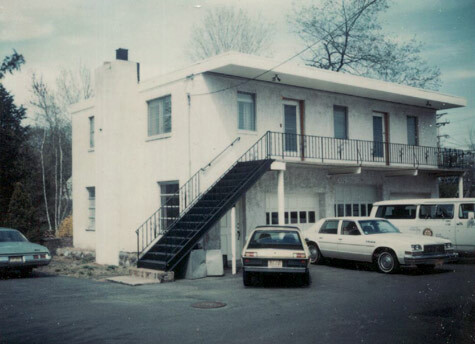 In 1980, when the state was still heavily reliant on boarding homes for people released from psychiatric hospitals, NewBridge created a state-funded, long-term community residence for older adults who had been hospitalized five years or more – the first of its kind in New Jersey. In 1983, the organization created NewBridge Jobs Plus, a free alternative education program for young adults from Morris, Sussex and Warren counties who struggled in traditional high schools. The program has since helped well over 1,000 young adults earn their high school diploma, prepare for college and technical schools and get on the path to a career. NewBridge Jobs Plus garnered national recognition in 2012 when it was featured on the CBS Evening News. A community tragedy in 1984 led to another NewBridge initiative. A school nurse contacted NewBridge after an eighth grader committed suicide. NewBridge put together a suicide prevention program for schools that is still in high demand today. NewBridge went on to develop an array of school programs geared to build resiliency in children and adolescents, including an anti-bullying program. Throughout the school year, NewBridge teaches students skills to safely navigate their world and make positive choices on the path to adulthood. At the other end of the age spectrum, NewBridge developed services to help seniors maximize their independence. In 1987, it created NewBridge Senior Assistance for Independent Living (SAIL), a free program that links residents of Passaic and Morris counties age 60 and over with community services to help them remain in their homes. NewBridge SAIL, which helps 400-plus seniors each year, added respite services for caregivers in 1999 and hired an Advanced Practice Nurse in 2003 to provide at-home medical evaluations. NewBridge@Home, launched in 2010, provides in-home counseling to homebound senior citizens and other adults who are unable to leave their homes. NewBridge's addiction services emphasize awareness and prevention through programs tailored for children, parents and educators. NewBridge provides evaluations, treatments and referrals for teenagers through seniors. In the late 1980s, NewBridge became a pioneer in treating mental illness and substance abuse together. Recognizing that many people with mental illness also had an addiction, NewBridge developed a screening process to identify clients with both, and provided training in addiction treatment to its mental health counselors. NewBridge provides employees training and supervision leading to dual licensing. It created a model for integrating addiction and mental health treatment at little expense, providing tools and resources which other agencies could replicate. NewBridge's co-occurring program received national recognition in 2010. With the departure of a long-term executive director in 1992, NewBridge was at a crossroads, faced with a choice that would decide its very existence: remain independent despite financial uncertainty or allow an area hospital to absorb the nonprofit. The board voted 11 to 1 to cede independence, but the lone dissent cast by member Marie Cetrulo prompted the board to reassess its position. After a great deal of investigation and soul-searching, the board determined that the commitment NewBridge had made to its communities would be diminished if it followed that path. The board then voted unanimously to stay true to its mission. That same year, NewBridge introduced the NewBridge 450 Program, providing 18 hours a day of intensive treatment services for former psychiatric patients living in boarding homes. (NewBridge had been providing some services to former psychiatric hospital patients since the late 1970s, when it established relationships with several boarding homes.) NewBridge again showed foresight in the mid-1990s when it created a drop-in center for boarding home residents. NewBridge saw another unmet need of providing homes for individuals with persistent and chronic mental illness when their families no longer could. A two-year study by eight NewBridge families culminated with the opening of NewBridge's first affordable housing project in Lincoln Park in 2000. In 2006, NewBridge pledged to provide 100 additional units of affordable housing within five years – a goal it achieved in 2011. Working in partnership with government agencies, municipalities and other nonprofits, NewBridge to date has created more than 200 units of housing in seven counties, and another 57 units are in development. Most are devoted to people with special needs. Helping individuals in crisis has always been a pillar of NewBridge, and that commitment led the organization to take on the role of community first responder. NewBridge has been on the front lines helping communities in Morris and Passaic counties cope with natural disasters since the mid-1980s. Following the September 11, 2001 terrorist attacks, NewBridge collaborated with other mental health providers, social services agencies and health care providers to create the Morris County Human Services Response Network, which the state recognized for its best practices. The effort led to New Jersey becoming one of the first states to certify disaster response crisis counselors. NewBridge remains true to its counseling roots, from helping families and individuals get through tough times to treating acute mental illness. NewBridge has specialized services for those resistant to treatment, and day programs for more intensive care. In 2001, NewBridge Enrich took root, helping clients develop skills for life and the workforce by tending a garden through a nationally recognized horticultural program. NewBridge Enrich connects clients with the outside world, helping to break down stereotypes about the mentally ill and beautify the community. The founders of NewBridge were ahead of the curve in creating an organization adept at assessing and meeting the needs of its communities. That forward-thinking approach transformed NewBridge from a small mental health agency into a multi-service community nonprofit that helps more than 10,000 people – from young children to seniors – every year. In 2012, NewBridge grew again when it created its Child and Family Services program to serve clients of the state Division of Child Protection and Permanency. Recognizing NewBridge's expertise in children's mental health services, New Jersey chose NewBridge over eight other providers and awarded the nonprofit a $1.4 million contract to serve victims of serious abuse and neglect, as well as their families, living in Morris and Sussex counties. NewBridge has received numerous accolades over the years. In 2012 alone, the NewBridge Evans Place Housing project won a Governor's Excellence in Housing and Economic Development Award, and Chief Executive Officer Robert L. Parker won the prestigious Ann Klein Advocate Award, which recognizes those who make extraordinary contributions to improving the lives of people with disabilities. NewBridge now employs more than 200 professionals who help people through five core program areas: counseling, addiction, housing, youth programs and senior services. With its headquarters still in Pequannock, NewBridge has offices in eight other towns and manages housing across six counties. It is licensed by the state Department of Human Services to provide mental health and addiction services and certified by the state Department of Community Affairs to build special needs housing. Like NewBridge's founders, today's leadership is committed to helping people move forward by tracking shifts in communities' needs and providing innovative, effective programs to meet them. As NewBridge embarks on its next 50 years, it stands as a premier provider of counseling services, housing and educational programs in northern New Jersey. New Jersey Smart Workplaces (NJSW) recognized NewBridge Services with a bronze award for helping reduce traffic congestion and improve air quality by providing commuter benefits to employees. The United Way of Passaic County honored Robert L. Parker, Executive Director, with its Community Cornerstone Award, given annually to an individual who exemplifies a lifetime of service and dedication to the community. New Views, a non-profit agency established to provide a variety of services for the population who suffer from an overlay of alcohol and drug abuse, as well as severe chronic mental illness, awarded Robert L. Parker, Executive Director, in appreciation of his support of New Views and its treatment programs. The Mental Health Association in New Jersey Inc. gave Robert L. Parker, Executive Director, a Golden Bell Leadership Award. The Mental Health Association highlighted NewBridge's Senior Assistance for Independent Living (SAIL) program, which helps residents of Morris and Passaic counties who are age 60 and over remain in their homes. Robert L. Parker, Executive Director, nominated Associate Executive Director, Michelle Borden, for her contributions as an outstanding social work manager, individual practioner, and academic at NewBridge. Borden was one of three social work executives that received the National Exemplar Award in New York City. Addiction Professional, a national magazine that highlights top-notch clinical services for addiction disorders, has named NewBridge Services' Joanne Goer, Director of Integrated and Addiction Services, Outstanding Clinician for 2010. The National Council for Community Behavioral Healthcare awarded NewBridge Services for recognition of its excellence in mental health and addictions services. Robert L. Parker, Executive Director, was honored as a valued member of the Housing Alliance of Morris County and recognized for his outstanding community service. NewBridge Services was selected by the New Jersey Association of Mental Health Agencies (NJAMHA) as 2008's Outstanding Provider for their ability to continuously develop innovative programs and services, consumer satisfaction, collaboration and staff development.